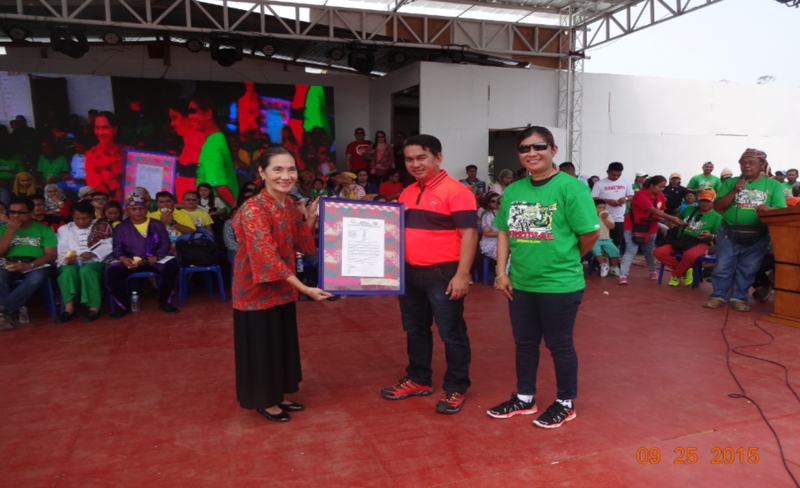 BONGAO, Tawi-Tawi- On Sept. 25, 2015, the provincial government of Tawi-Tawi again recognized the contribution of Ms. Ligaya Fernando-Amilbangsa to the preservation of the rich cultural heritage of the province during the Agal-Agal Festival program held at the DepEd Compound as part of its 2nd annual Kamahardikaan celebration. Immediately before the awarding, Dr. Filemon G. Romero, Chairman of the Agal-Agal Festival Committee, read Resolution No. 19 s. 2015which granted Ms. Amilbangsa the Life Achievement Award as a Tawi-Tawian. The resolution stated that Ms. Amilbangsa is “considered a Tawi-Tawian,” due to her marrying Datu Punjungan Amilbangsa and her having lived a major portion of her life in Sitangkai, Simunul, and Bongao. It also recalled that in 2011, she was awarded the Most Outstanding Tawi-Tawian in the field of culture and arts due to her contribution in the preservation of the rich cultural heritage of the province as the founder of MSU TCTO Tambuli Cultural Troupe, which still continues to preserve the authenticity of the native dances and music of Sulu and Tawi-Tawi. The resolution also mentioned her authoring two books: Pangalay: Traditional Dances and Related Folk Artistic Expressions, and Ukkil: the Visual Arts of the Sulu Archipelago, as well as her developing a dance vocabulary and methodology to teach Pangalay to non-native dancers. Finally, the resolution also cited Ms. Amilbangsa’s having received a Ramon Magsaysay Award in 2015. Officials from the different towns of the province looked on as Ms. Amilbangsa was conferred the “Lifetime Achievement Award to a Tawi-Tawian.” Ms. Amilbangsa graciously accepted the award with a speech amid a colorful sea of dancers and boat-inspired floats. After the awarding ceremonies, participating municipalities showcased the rich cultural traditions of Tawi-Tawi through their dance showdown pieces highlighting different aspects of their culture, as well as the important role of the Agal-agal (seaweed) industry. Among the board of judges for the street dance competition and dance showdown were Ms. Amilbangsa’s former and present Pangalay dancers: Hja. Sakinur-Ain Delasas, who is now the Artistic Director of the Tambuli Cultural Troupe; Mahail Hadjan, who founded another cultural troupe, the Jama Sambatau; and Louanne Mae Calipayan, who is with Ms Amilbangsa’s Manila-based group, the AlunAlun Dance Circle.